Debt is a problem. With our house we’re $90,000 in debt and scheduled to be debt free and paid off in the next 5 years. 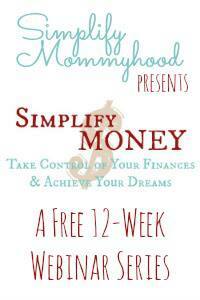 I’d love to have it all paid off in three but I couldn’t think of what else to do and then I found Danielle of Simplify Mommyhood’s upcoming series called Simplify Money. It starts today, August 20th at 9:30-10 for all my fellow Eastern Standard timers (8:30 if you’re Central) and runs for 12 weeks. We’re on track to pay off $90,000 of debt in the next five years but I want to be debt free in 3 years and Danielle will help. I’m most excited about discipline & accountability, time management, working from home, getting organized, …well…I’m actually excited about every single one! I’m excited because we want to become a stay at home family and start traveling with the kids to give them some real hands on learning. Ben works 7 days a week and has for years. Granted he’s on first shift now which HELPS TREMENDOUSLY! in the sanity department but…we need more time with him. We know the more we can do to save money and get everything paid off, the sooner we’ll be running our own business and of course moving!! We want a farm big enough to have our Jersey cows pastured on our land as well as the goats, chickens and our big ol’ garden. We especially want to make it so our kids aren’t in the same boat we were when we started out.